: Carvone, limonene, phellandrene, eugenol, pinen. Dill Seed is a member of the Umbelliferae (parsley) family. It grows to about three feet high with inflorescence of yellow flowers, appearing in the summer. The seeds of the plant are used to extract the oil. A middle note of medium aroma, this oil is fresh and sweet with qualities similar to anise seed. Aromatherapists credit Dill Seed Therapeutic Grade Oil with being stimulating, revitalizing, restoring, purifying, balancing and a cleansing agent. 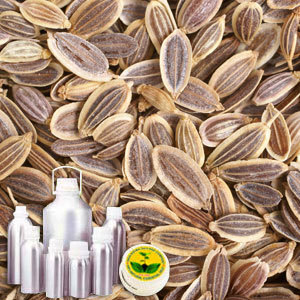 Dill Seed Therapeutic Grade Essential Oil recommended due to its various therapeutic properties which include - Anti-catarrhal, anti-inflammatory, antimicrobial, antiphlogistic, antiseptic, astringent, balsamic, carminative, cicatrisant, emmenagogue, expectorant, fungicidal, sedative, digestive and pulmonary stimulant, stomachic, tonic, uterine and vulnerary.